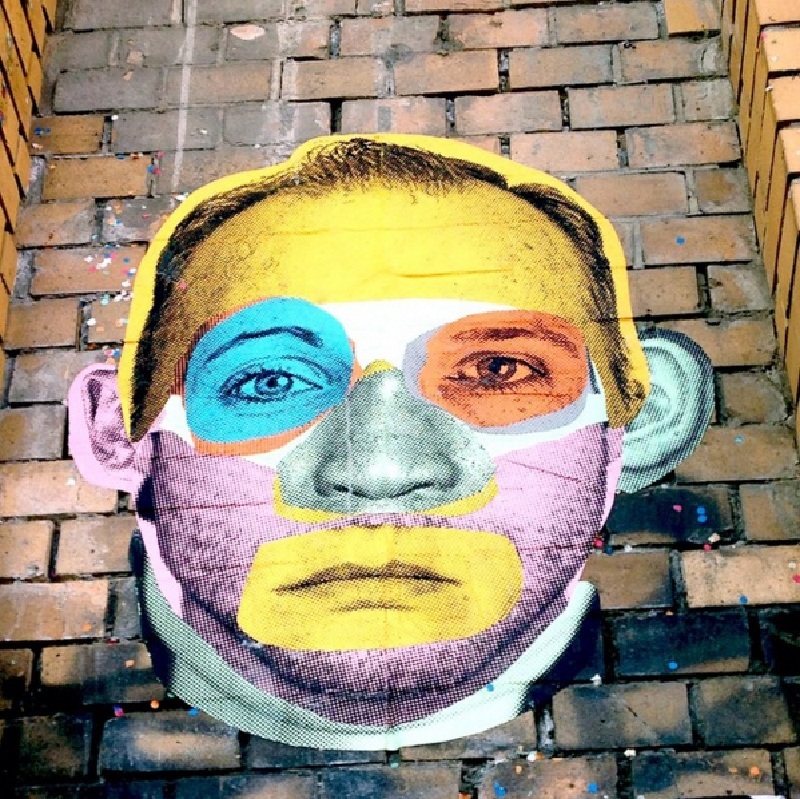 Who Are The Best Street Artists in Berlin? With the official “City of Design” title and unofficial titles like “global street art capital” and “the graffiti Mecca”, Berlin naturally became a venue of interest for many street art creatives of various backgrounds, who work in a range of different media. Berlin is truly a unique city when all kinds of public art expressions are concerned. From the rich history that began on the Berlin Wall to the abundance of street artworks and impressive street art diversity the city has to offer today, German capital is still a great place to explore various possibilities of urban art expressions. Artists know this well, and over the years, many renowned figures of the movement have left their marks on the walls. However, the city also gave birth its own outstanding talents, artists who have contributed greatly to the development of a dynamic local scene. 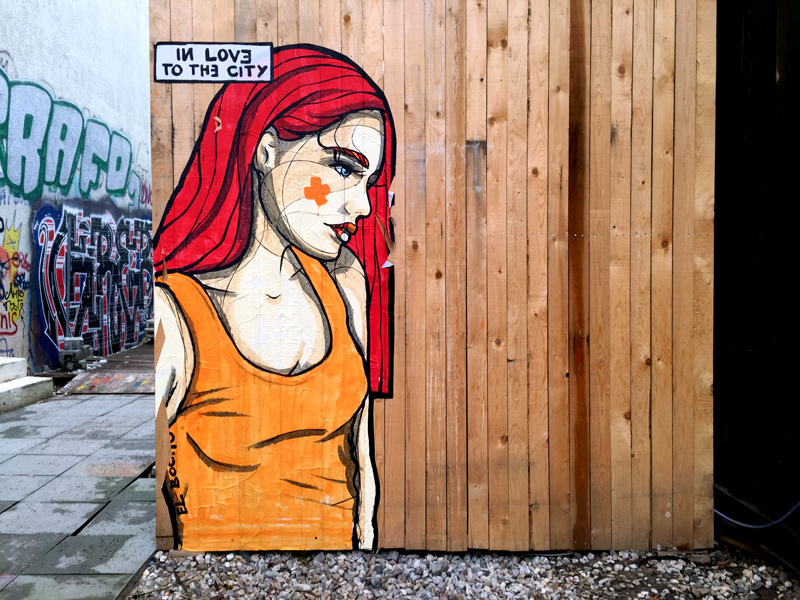 Whether it is their hometown, or they came from elsewhere but call Berlin their home, we are taking a brief look at today’s most praised street artists who prolifically create on the streets of Berlin. Let us start by introducing the artist XOOOOX, one of contemporary stencil masters who was among the first Berlin artists to gain prominence on the international art market. Now in the mid-thirties, XOOOOX became known for his monochromatic, black and white stencils of young, beautiful women followed by bubbly tags of x’s and o’s. Appearing all across the city, female figures by XOOOOX open some important conversations regarding fashion culture, beauty standards and the ideology of late capitalism. The complexity of the artist’s work comes from the uncertainty whether his stencils are a straightforward homage to the fashion world or critical, anti-capitalist statements. This duality and openness to interpretation is what makes XOOOOX’s work ever so relevant in conversations regarding subversive potentials of street art, while on another level his lonely, melancholic beauties stay extremely approachable, evoking a sense of shared human experiences. A self-taught artist, working primarily in the stencil medium, Alias is often described as the city’s most prolific and busiest street artist. Present on the German street art scene since the mid-1990s, Alias distinguished himself from the peers through his instantly recognizable stencil style, consisting of black and white figures, sometimes stylized through the use of intense red color. Capturing their subjects in the moments of quiet introspection, Alias focuses on the theme of harshness of life in everyday society, the theme he cleverly underlines by choosing the right location for his artworks, exposing his vulnerable subjects to the hostile urban environment. Although his messages are subtle, the artist is mindful about social and political issues of today. Usually focusing on internal, personal and intimate experiences, Alias presents us with engaging and relatable characters which seem detached from the society, yet strongly affected by it. The lonesome, somber figures provoke strong emotional response from the passersby, inspiring compassion and empathy on a humane level. Quite opposite of the bleak and serious atmosphere Alias’ works might create, paste-ups by El Bocho embody humorous, playful and colorful spirit of street art. 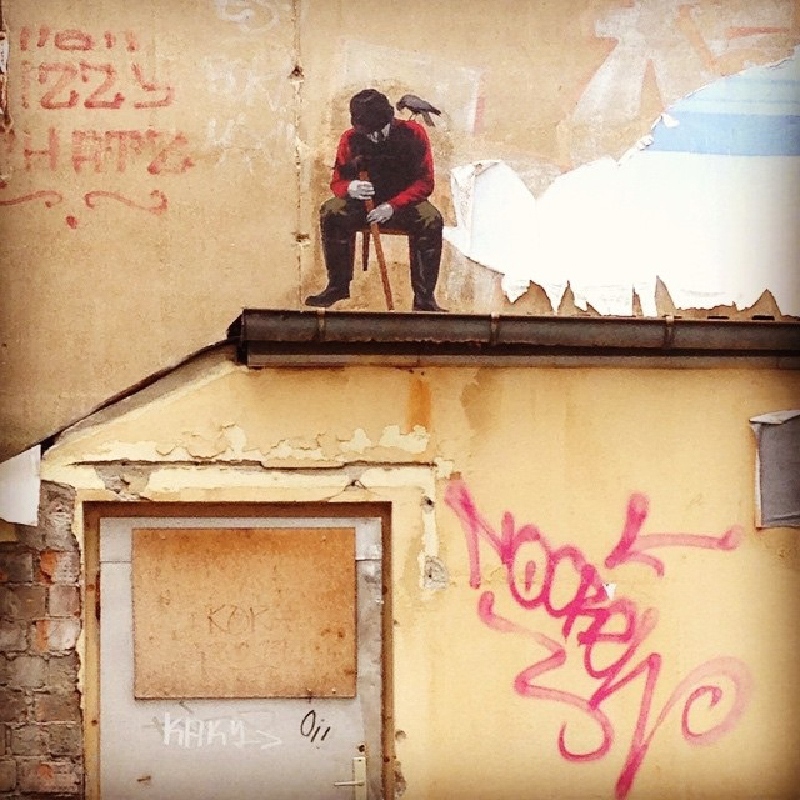 Originally coming from Spain, El Bocho eventually settled in Berlin, becoming one of the city’s most visible artists. 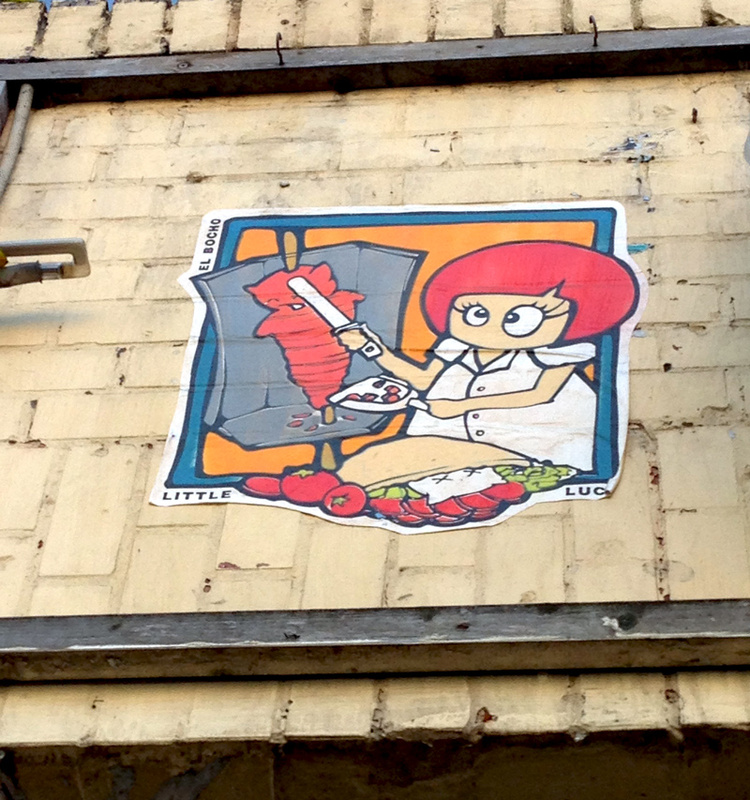 El Bocho’s initial fame came from his whimsical character called Little Lucy, inspired by the TV-series “Little Lucy – Fear of the Streets.” In El Bocho’s work, Little Lucy, a wide-eyed, helmet-haired girl was given a new mission – to find ever so innovative ways of killing her pet cat. Amusing and hilarious, Little Lucy became synonymous with El Bocho’s work, to the extent artist adopted the character’s name as his moniker for a limited period of time. The dark humor that dominates the Lucy series was replaced by the more romantic vision in the development of the artists “Citizen” characters, usually beautiful girls who express their love for the city of Berlin. Through many of those different phases, El Bocho gained praise for his masterful use of paste-ups, as well as the scale and quality of his works. If you are wandering the streets of Berlin there is a great chance you will stumble upon some funny characters which look like they’re smiling at you or mocking you. At that point, you can be sure that you’ve discovered the work by Berlin’s artist who goes by the moniker Mein Lieber Prost. Due to the artist’s efforts to keep his artworks constantly in the public eye, and due to their artistic simplicity, which makes them fast for the execution, Mein Lieber Prost’s smiley faces can be found almost everywhere, lurking in the most unexpected places. Sometimes just simple black outlines, on occasion filled with blue, white or red, Prost’s characters evoke the cheerful atmosphere wherever they appear. The little figures bursting into laughter, while at the same time pointing their fingers at the audience, initiate direct interaction between the artwork and the beholder. The participatory aspect of public art is particularly strong in Mein Lieber Prost’s work, and even if his characters are simple, there isn’t a chance you will pass by and not wonder what the joke is about. Is it the society, the environment, or is it you they are laughing at? Born in France, the artist SP38 has been calling Berlin his home since 1995. Because of the speed he creates his works at, as well as the repetitive nature of his creative process the artist has been known to refer to himself as a “human copy machine”. Attracted by the free-spirited street art scene that emerged in Berlin after the fall of the Wall, SP38 moved to Berlin, taking part in numerous artistic squats, and making his name on the streets with his unique poster art. 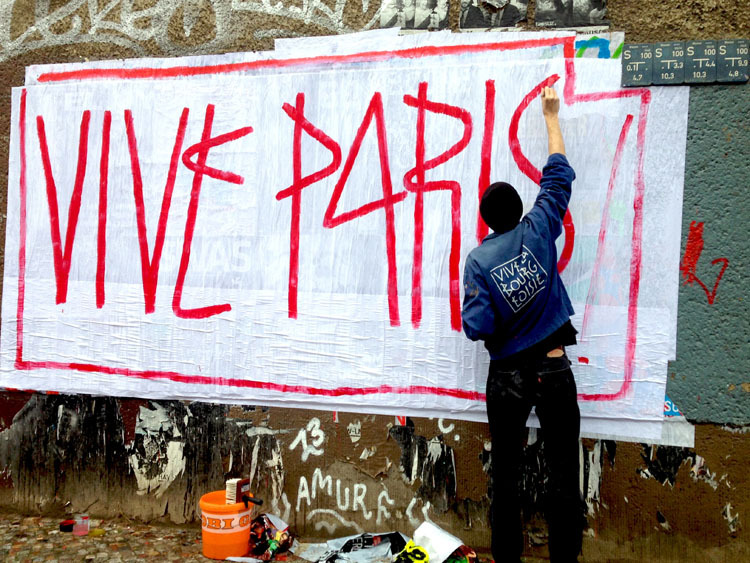 SP38 is widely known for his white posters, which are carrying powerful slogans in basic colors and signature typography style. Being Berlin resident for twenty years, his works often reflect on social and cultural transformations the city has been experiencing over time. Drawing inspiration for his slogans from various sources, from literature to politics and everyday social situations, SP38 creates provocative, ironic and witty artworks that serve as a wake-up call to those who pass by them, opening conversations on burning social topics and triggering active engagement from the audience. After so many years, SP38 is still among the most active street artists in Berlin whose artworks can be seen on numerous walls across the city. After SP38, who may be called Berlin’s street art veteran, it’s time to take a look at an outstanding young talent on the scene. Going by the name Negative Vibes, the upcoming stencil artist has captivated the attention of many Berliners through his delicate black and white artworks found in hidden, well-chosen locations. The choice of the subjects and technique to some extent are reminiscent of Alias’ works. Just like Alias, Negative Vibes usually depicts injured children, disconnected teens, and isolated individuals, yet where Alias stays subtle in his approach, Negative Vibes is more direct in presenting states of fear, hurtfulness and solitude. As his moniker suggests, the artist is more focused on darker sides of human minds, and the bleak, ominous atmosphere he’s presenting is underlined through the use of demonic imagery and even occult symbolism. 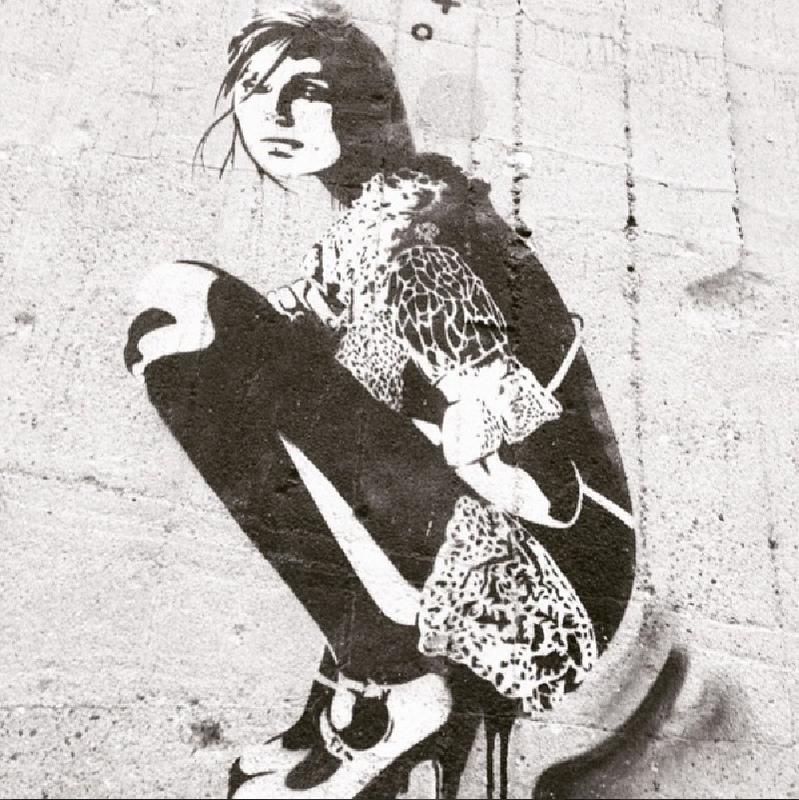 Nonetheless, the aspiring artist has joined the line of great stencil artists on the local scene and he is certainly among the most interesting new finds when Berlin’s street art is concerned. After a line of artists who prefer to work on their own, it is time to meet one of Berlin’s most interesting art duos. Working together since 2005, Various & Gould became unavoidable in talks about the local street art scene. While their work is often based on the mediums that include paper, from paste-ups to screen-printing and collages, Various & Gould don’t like to be limited to one strict artistic direction. It is why they often experiment with installation, mural works, and public performance. Various & Gould are known for actively exploring the realities of the social environment, tackling various themes and subjects from pressing social issues like migration, unemployment, financial crisis to complex cultural phenomena such as questions of identity, gender politics and religion. Although they raise some serious questions, they tend to do it in a colorful and playful manner, uncovering the beauty that lies in everyday life. On the streets of Berlin, it is their large paste-ups that usually attract attention of the observers, and they are truly magnificent additions to the city’s already versatile street art scene. The last, but not the least important on the list is Alaniz, the Argentinian-born artist who has been living and creating in Berlin for the past four years. 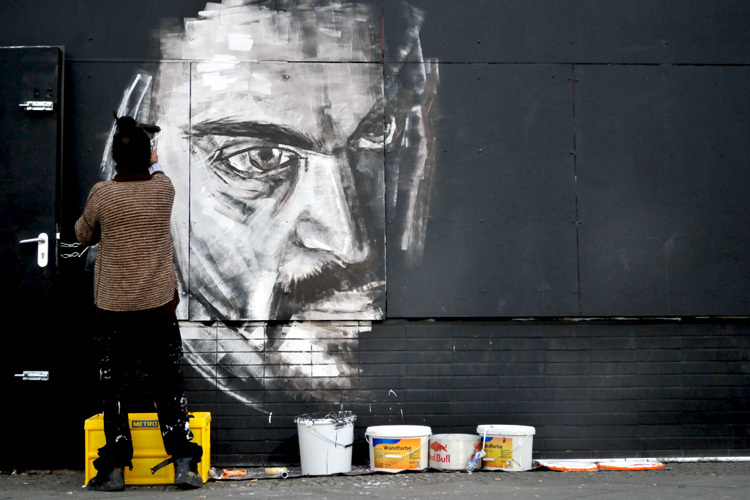 Although his participation in the city’s street art scene is not lengthy, he quickly gained attention of the audience with his inspiring mural works. Although he doesn’t consider his art to be directly connected to any political and social agenda, he strongly believes in the power of public art to initiate dialogue and implement change toward the better society. It is interesting to note that even if he mostly does large paintings, which take more time than spontaneous urban interventions, he prefers to create illicit artworks, painting on the walls that have been left neglected and overlooked. Attentive to details and conscious about the placement of his paintings, Alaniz masterfully integrates his artworks into the surroundings, making them the organic parts of the city environment.